Enter a key in step one and a mode in the step 2. Done! Tonecalculator does the rest. Just copy the result into your DAW. Example: Unison for the kick, the fifth for the snare and the fourth and sixth for the toms. Tune to the closest key be clicking the cent-button. Enter a tempo or frequency you want for your song. Press alt and click the cent-button. ToneCalulator will provide you with the correct concert pitch and the Keynote. When ToneCalculator is started it shows up in Simple View (see Fig. 2). Here you can enter the key of your song in Step 1. Than enter the mood, which can be major or minor in Step 2. ToneCalculator provides you with the Result on the right side of the window. In the table inside the Result-box you can find all tempi that are in the key you picked in step 1 and 2. The lower list are the best frequencies to tune your percussion instruments to. Most harmonic is the octave (unison) followed by the fifth, fourth and so on. Example: Tune your kick drum to Unison, the snare drum to Fifth and the toms to the Sixth and Seventh. 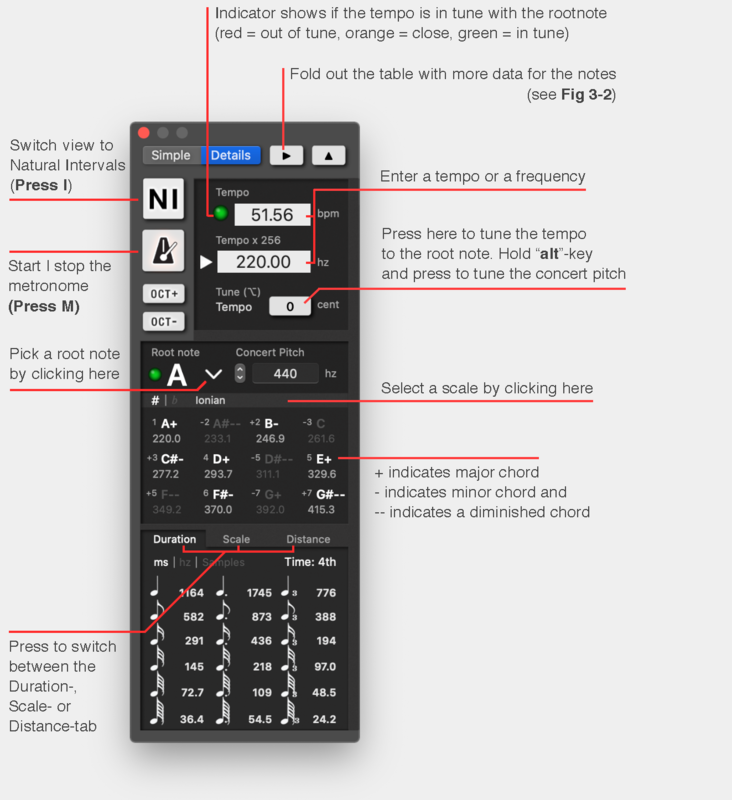 Use the „multiplication“-buttons (see Fig.1) and try one octave lower of Unison for the kicks subbass frequency. 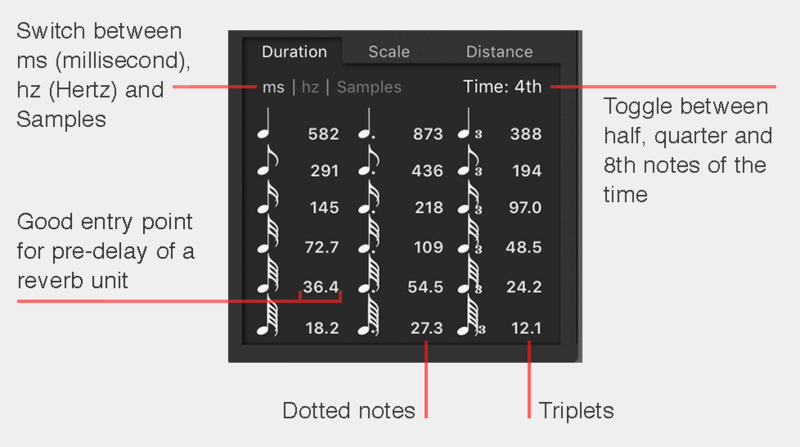 You can start by entering a tempo or a frequency in the first box called Tempo (see Fig. 3-1). The tempo is measured in bpm (beats per minute). The frequency below the tempo is the 8th octave of the tempo, meaning the tempo was doubled eight times and converted in hz (Hertz) which is equal to bps (beats per second). Note: 60 bpm = 1 bps = 1 Hz (Hertz). 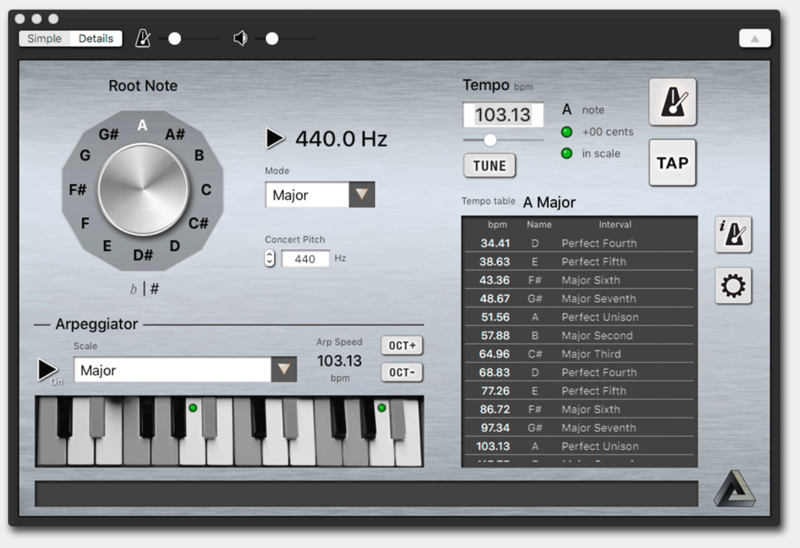 Once you entered a tempo you‘ll find the closest root note to the tempo in the „Root note“-box. Below the tempo and its frequency is the „cent“-button. 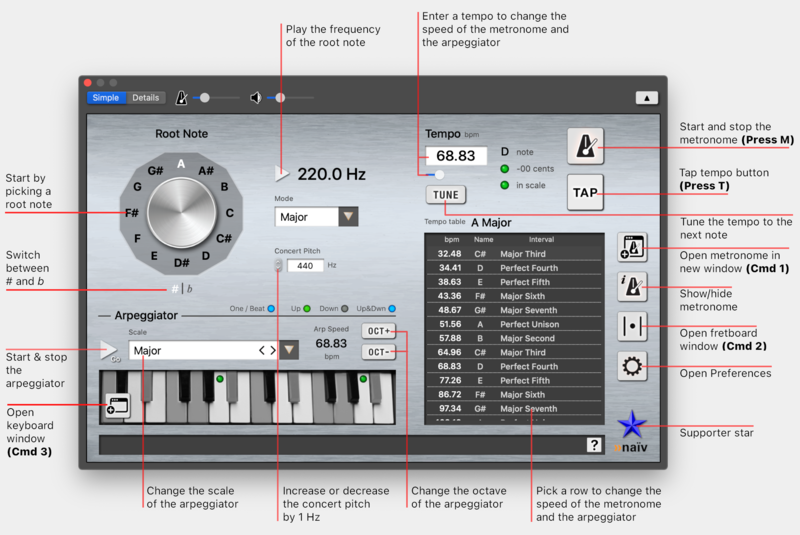 Tune the tempo to the root note by pressing the button and setting cent to 0. The indicator in the Tempo-box will turn to green, meaning the tempo is now in tune with the root note. Tip: If you hold the alt-key and press the „cent“-button the concert pitch will be changed instead of the tempo. Use this function if you want to have an exact tempo, but keep in mind that you have to change the concert pitch in your DAW which is usually set to 440 Hz. 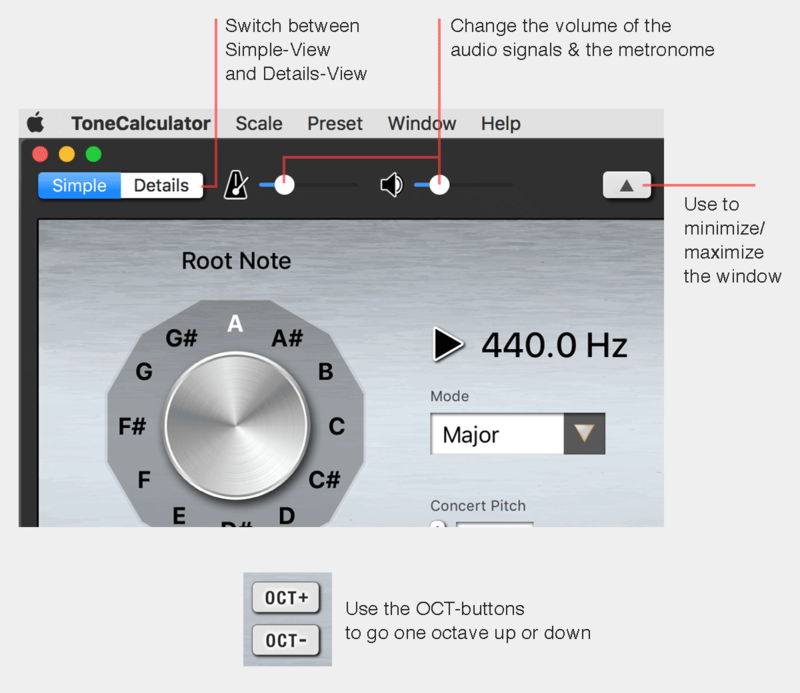 You can also click on the root note and ToneCalculator will provide you with the tempo, that is an octave of the picked root note. Use the multiplication buttons to jump to other octaves. Click on Duration to see the times of quarter notes, 8th notes, 16th notes and so on. The 2nd column shows dotted notes and the 3rd column shows triplets. These times can be used for delays, reverbs (pre delay time), compressors and gates. Especially compressors are often not linked to the DAW’s tempo. To find a good entry point for the pre delay time of your reverb enter your tempo and than use the 64th note (see Fig. 4) as your pre delay time. Tip: By adding half of a millisecond or rounding the given value up to the next full number, the result may even sound a little bit more pleasing. 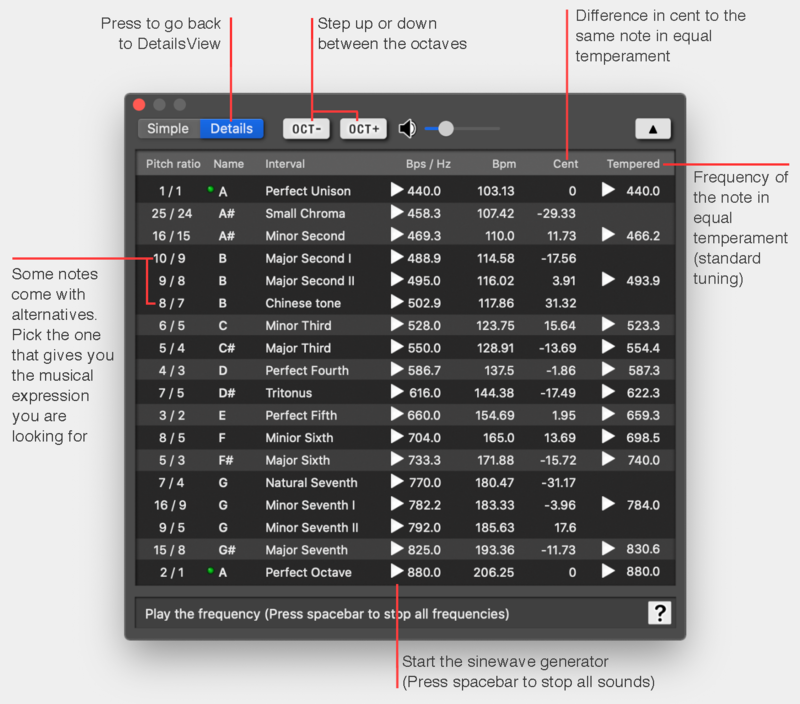 Switch from ms to hz to display the low frequencies. These are used for LFOs (low frequency oscillators) inside your favorite synthesizer. Click on Scale to activate the scale matrix. 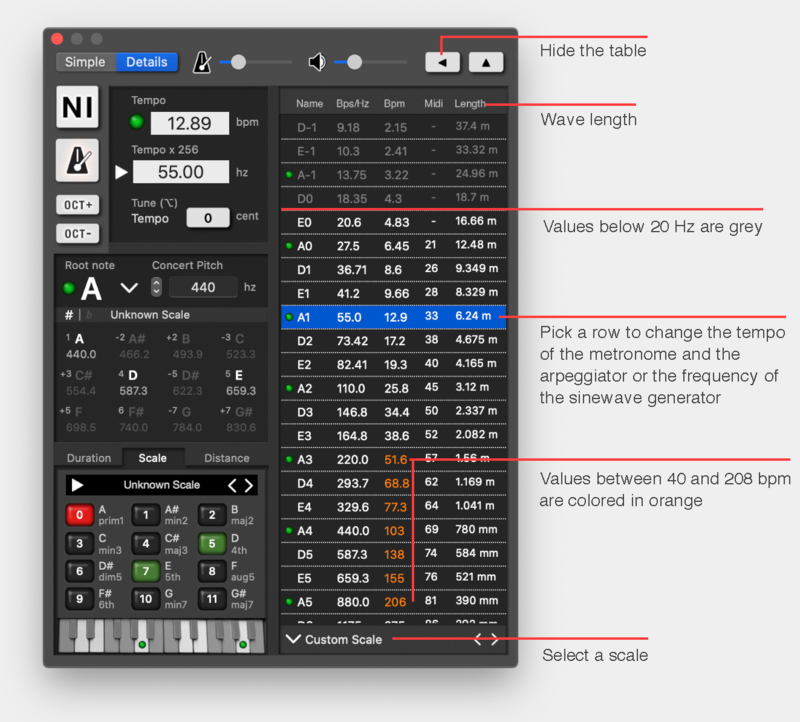 Only the selected notes are displayed in the table on the right. You can choose between several presents by clicking on the selector underneath the table or the root note. 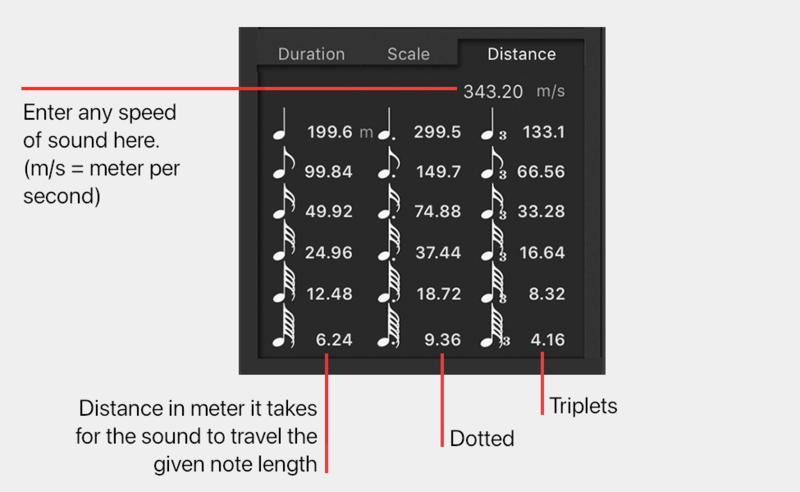 The values shown in this tab give you the distances it takes for the sound to travel in musical times or certain note lengthes. The default value for the speed of sound is in air at room temperature (343.2 m/s). Positioning your microphone in the given distance will result in a delay that is synced to the tempo of your song. There are some room simulations with a variable room size. This is where distance-values also come in handy. This is a table of frequencies as they occur in nature and therefore in the overtones of instruments. In the last column “cent” the difference to the note in equal temperament is shown. Important: You can only access the Natural-tab, when you are in Expert View. Here you can find a collection of different scales. 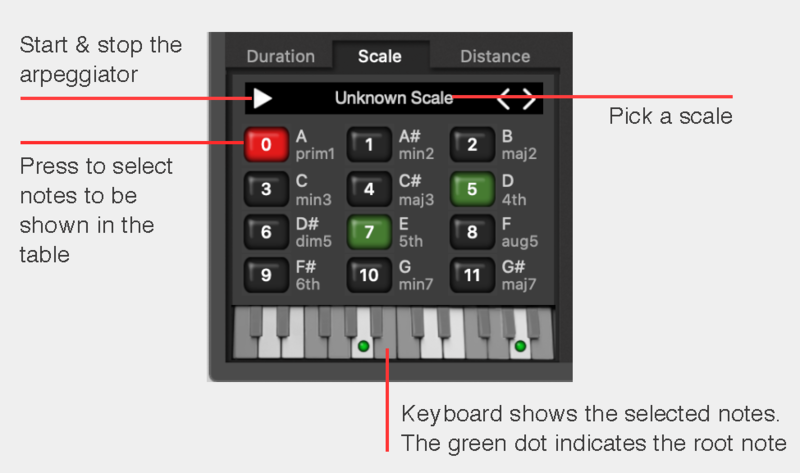 Selecting a scale will affect the Simple and the Expert view and will change the output of the view's table. 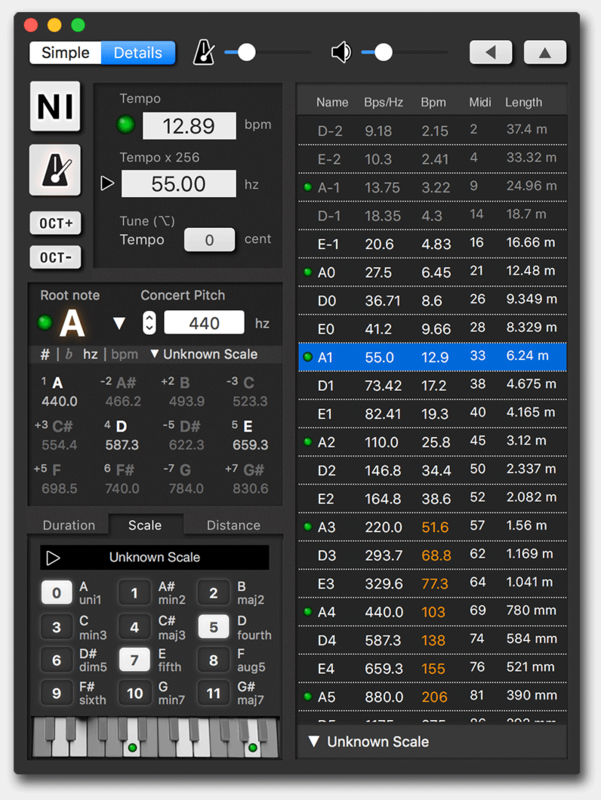 You can select the scale also in Expert view under the table or the root note. 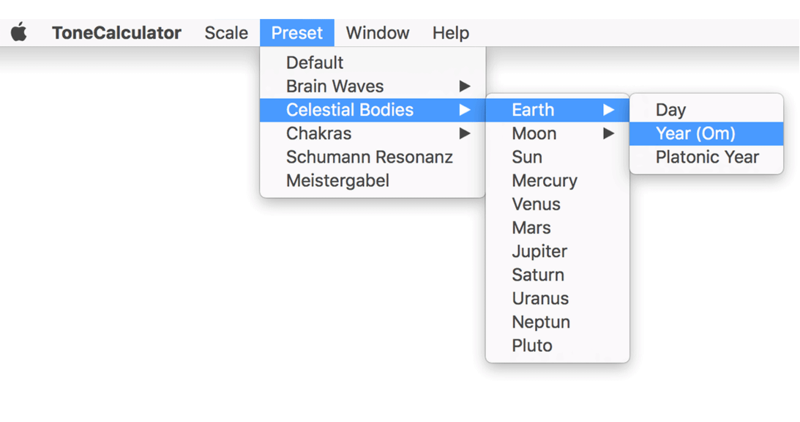 Here you can find a collection of frequencies, that can be an inspiration for your compositions. But be aware of a change in the concert pitch in order to get a specific frequency.